The legends of the origins of Tarot are many, wonderful and diverse. Ancient Egypt, long regarded as a source of the mysterious and magical, with its secret chamber of initiations deep in a pyramid. Atlantis, where master magicians seek to preserve their wisdom before the continent sinks beneath the waves of destruction, forever lost to humankind. Wise women healers, who know they must conceal their thousand-year-old teachings from the fires of the inquisition. Mystical rabbis, deep in ecstatic trance visions of the Tree of Life. Romany Gypsy masters of fortune telling. Moroccan mages and the Holy Grail. All these legends and more have been described as the true origin of Tarot. And yet, on the other side, we find those individuals who insist that the Tarot is ‘nothing but a game,’ a simple pastime invented for nothing more serious than the courtly amusement of noble European ladies and gentlemen. For hundreds of years, the Tarot has been a source of mystery and fascination, intriguing us with its compelling and enigmatic pictures and symbols. No one really knows where the Tarot originated, or how or why it works. One thing seems certain though – if we can ‘tune in’ with the images presented to us on the cards, then we can gain access to a deeper understanding of ourselves and the people and events involved in our lives. 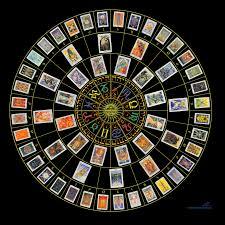 When most people think about Tarot they think of readings. Often, what they think is tinged with fear. Ask them if they want a reading and they may laugh, embarrassed and say ‘No thanks, that stuff scares me.’ Or they may have tried reading cards themselves when they were younger, but then put them away when they discovered it worked. Partly the images scared people, all those men with swords in their backs, the Devil with his chained slaves, and Death harvesting heads. Or maybe they heard somewhere that Tarot is evil, involved with ‘black magic’. Mostly, however, what scares people is the idea that it works. How could such a thing be? How can you mix a pack of cards, choose some at random, and discover things about yourself or others – let alone predict future events? And how can a total stranger do such things? No wonder it scares people. All divination works through patterns. Divination makes an assumption, that the patterns we create through mixing different bits of information will tell us something meaningful about our lives. In the case of astrology, the bits of information involve the planets and signs as they move in relation to each other according to mathematical formulas. 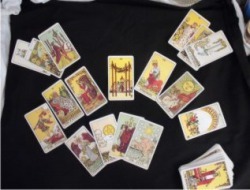 In the case of Tarot, the information involves the symbolic meanings of 78 picture cards shuffled together and laid out according to a series of questions. The simple answer is that nobody knows. In ancient times, people believed that the gods or spirits directly influenced the fall of the cards, so that they would give a true answer. Remember that ‘divination’ comes from the same root in Latin as ‘divine’. In many ancient cultures, divination was often regarded as sacred, or pertaining to the gods. Today, we can use the Tarot for many purposes – to ask for advice about a best course of action, to gain insight into life’s spiritual ‘lessons’, as a tool for meditation and self-discovery, and also to develop our psychic ability and interpret what we see for others.